In May 2017 I bought a U2415 which I used in combination with some older DELL monitors. Now I just acquired another two U2415 to replace those older monitors. Unfortunately with the same settings my first U2415 seems more blueish than the new monitors which appear more yellowish. Could the difference be due to the fact that they most certainly come from different batches? How can I easily calibrate all three monitors consistently? Set one to your liking via the OSD (On Screen Display) -Color -Preset Modes -Custom Color and tweak the Red/Blue/Green. Then move to the other two U2415 and try to get a "closer" match to the first one using their Custom Color settings. The only way to precisely "match" them is to calibrate them all using 3rd party calibration hardware (colorimeter) and software. Thanks Chris for the quick answer and precious advise. As per your recommendation I switched to "Custom" profile and adjusted the colours gain to match the tint of my older monitor. However I did not do it through OSD which is rather unpractical when dealing with three monitor. Instead I used Monitor Configuration Demo (MCD). As soon as you start adjusting the colours in that MCD software the monitor switches automatically to "Custom" profile. Initially the brightness of the new monitors felt weaker than on my original U2415 but it seems some kind of auto brightness could have been at play there as I soon as I started adjusting the brightness in MCD it fixed itself and the brightness of each monitors appear aligned. Thus I'm conveniently able to keep the same brightness level in all three monitor. To compensate the yellowish tint of the new monitors, compared to my older one, I only took off a few percentage points from their red and green colour components as shown below. So far I'm quite satisfied with this setup. However it seems I can't use "Dynamic Contrast" when using "Custom" profile. 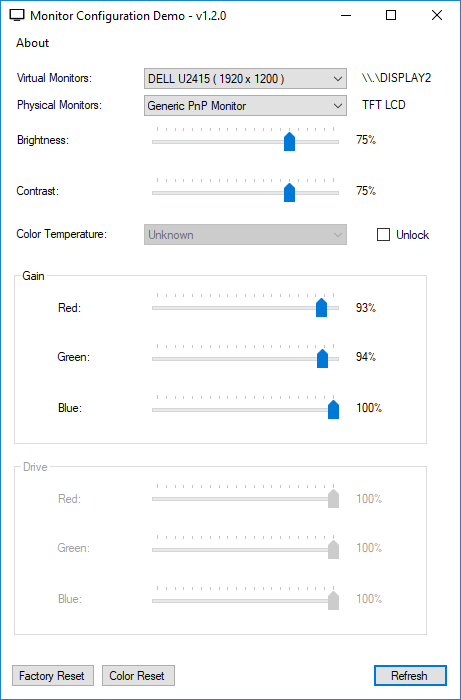 The "Game" profile which lets you use "Dynamic Contrast" does not let you adjust the colour channels but only offers "Hue" and "Saturation" and I'm not sure I can match the monitors tints with those. So it appears although I can easily match the colours in "Custom" preset I do loose the benefit of "Dynamic Contrast", could you confirm that? So that NOTE certainly sounds like Dynamic Contrast is designed for Game and Movie Preset Modes.